In the United Reformed Church the Minister arrives and moves on over a relatively short period - perhaps five or six years. So many Ministers contribute in their own way to the development of the Church. In Brentwood we were very fortunate. Not only did we have some very good Ministers but we had an Associate Minister - The Revd. Professor Colin Gunton, who sadly died in 2003. There is not enough space on this page to describe the achievements of Colin, it would take a web site all of its own. But to us he was just Colin. The Associate Minister who stepped in during periods of interregnum, Who ably chaired the Church Meeting, who was the rock on which the theology of our little church was founded and a friend and mentor to all who knew him. If, as Kees said, the Church is made up of people rather than buildings I would rather like to think of Colin as a foundation stone, one of several, but without which the Church would be much less strong. Colin was one of the country's leading theologians - arguably one of the most influential theological thinkers of the last twenty years. He made our pulpit one of the best known in the country! His legacy lives on in the many Ministers, writers and fellow theologians who followed him and, as we do at Brentwood URC, value his great works. Details of the major theological works that Colin published can be seen here. For the Church in Brentwood we were honoured by the publication of Colin's work "Theology through preaching" a volume containing a number of sermons that we were lucky enough to have Colin preach to us. There continues to be much discussion in academic circles on Colin's enormous influence on English theology, , see for example this. 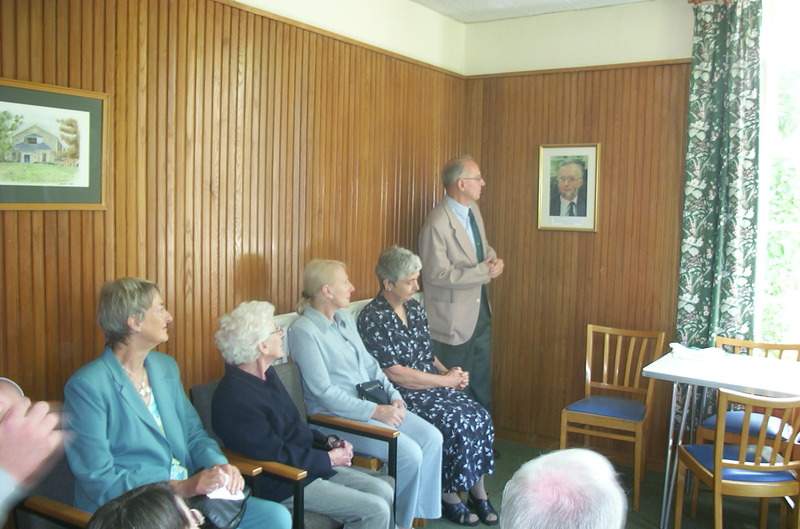 There was also a conference on Colin on the 10th September 2007 with papers by Stephen Holmes, Robert Jenson, John Colwell ( who we are honoured to have preach here from time to time) and Douglas Knight. The full extent of Colin's profile can be seen by entering his name in to Google. He may have been promoted in to the heavenly hosts, but his work and teachings live on; Praise the Lord. There are theologians and then there are theologians like Colin Gunton. His work on the doctrine of the Trinity and doctrine of Creation have helped people understand and grasp their meaning and importance. Colin was one of a group of theologians who helped reestablish theology on a trinitarian basis and do theology from trinitarian perspective. In short, he took the doctrine of the trinity seriously. Colin E. Gunton was Professor of Christian Doctrine at King's College London from 1984 until his sudden death in 2003. This item is reproduced from http://andygoodliff.typepad.com/my_weblog/2005/02/emcolin_guntone.html by kind permission of Mr. Goodliff.